Highland's "Last Call For Summer"
You are here: Home / Highland's "Last Call For Summer"
More About Highland's "Last Call For Summer"
Preparations are being finalized as Highland’s Main Square Park will be the venue for “Last Call For Summer” on Saturday, August 11th, from 1 pm to 6 pm. The new event is being hosted by the Highland Main Street Bureau, in conjunction with the Highland Redevelopment Commission. The event name and date highlight a farewell to summer on the last weekend before the 2018-19 school year is set to begin. The event is free. 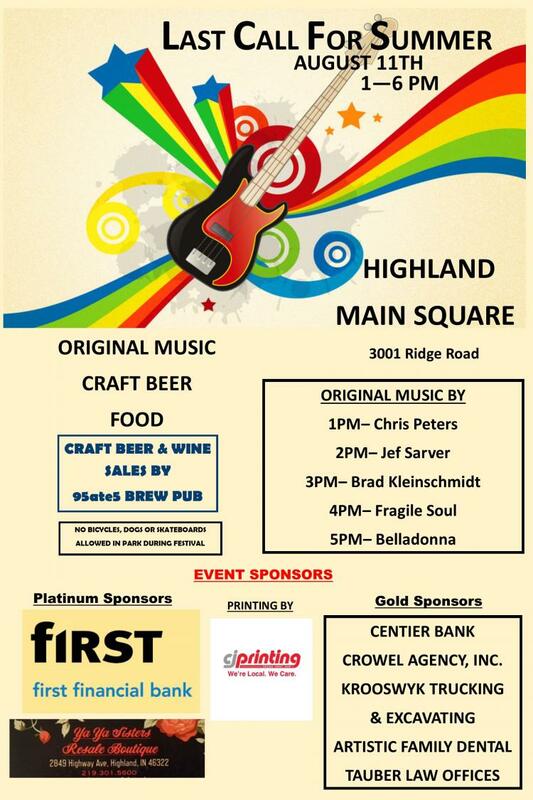 The event offers original music, food from Highland restaurants and a beer garden, operated by 95ate5 Brew Pub. Breweries to be featured include: Byway Brewing, Devil’s Trumpet Brewing, 18th Street Brewery, Revolution Brewing and Greenbush Brewing. Platinum sponsors for the event include YaYa Sisters Resale Boutique and First Financial Bank. Gold sponsors for the event include: Centier Bank, Tauber Law Offices, Artistic Family Dental of Highland, Crowel Agency, Inc. and Krooswyk Trucking and Excavating. Printing was provided by CJ Printing, of Highland. The event will showcase the food of Highland restaurants Beer Geeks, Langel’s Pizza, Maria's Buena Cocina and Jose’s Family Restaurant. Also, the event will spotlight a lineup of talented musicians playing original music. The entertainment lineup is as follows: Chris Peters- 1pm; Jef Sarver- 2pm; Brad Kleinschmidt- 3pm; Fragile Soul- 4pm; and, Belladonna- 5pm. Additional information on the event can be found on the event’s Facebook Event page at click for details , following on social media the hash tag #LastCall4Summer or emailing lryskamp@highland.in.gov.